Brigadier General John Hunt Morgan and his Confederate raiders, wearied by the relentless Union pursuit, crossed the Hocking River into Nelsonville in the mid-morning of July 22, 1863. They found the town almost abandoned. Nelsonville's local militia were in nearby Athens, the raiders' rumored next destination. The local newspapers had reported that Morgan had very few troops remaining after the Battle of Buffington Island, and residents were lulled into thinking Morgan was not headed in their direction. On Morgan's arrival, the mayor immediately surrendered the town, hoping to avoid extensive damage. The Confederates helped themselves to the food families had prepared for themselves. 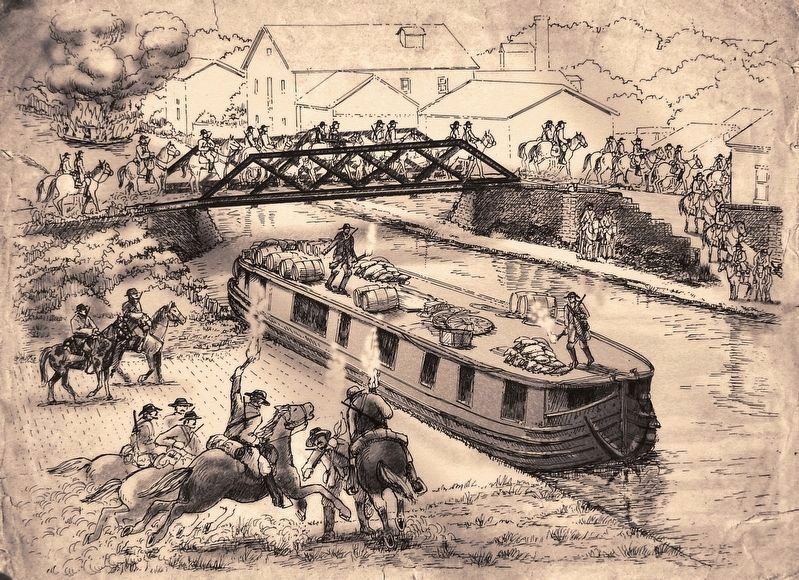 Despite the mayor's request, Morgan ordered about a dozen canal boats and a canal bridge put to the torch, and the fire spread to an adjacent coal yard. A flour mill was spared only through a personal plea to the general by the owner's wife. arrived about six hours later. The Civil War, which most thought would be over quickly, had bogged down into a long fight between the states. Heavy fighting was going on in Gettysburg, Pennsylvania, and in Vicksburg, Mississippi, when Confederate Brigadier General John Hunt Morgan brought the war to the northern home front. Racing through Indiana, he crossed into southwestern Ohio on July 13, 1863, and brought more than 2,000 veteran raiders with him. Their mission in crossing the state was to occupy and divert as many Union troops as possible. Department of the Ohio commander Major General Ambrose Burnside sought to stop Morgan, but that would prove a much harder job than he expected. Marker series. This marker is included in the John Hunt Morgan Heritage Trail in Ohio marker series. the right when traveling west. Touch for map. 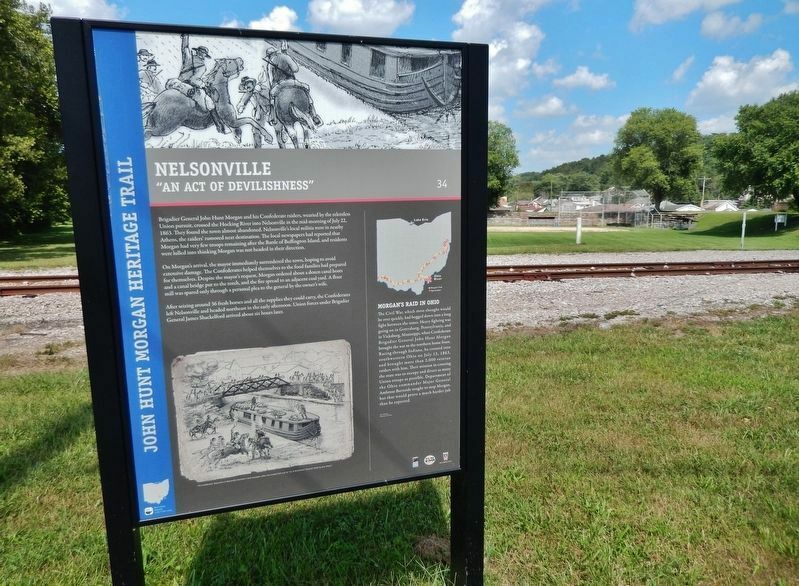 Marker is located in a small pull-out between the highway and the railroad tracks, just west of the railroad crossing and east of the Nelsonville City Hall. Marker is at or near this postal address: 211 Lake Hope Drive, Nelsonville OH 45764, United States of America. Touch for directions. Other nearby markers. At least 8 other markers are within walking distance of this marker. Hocking Canal Site (approx. 0.2 miles away); Camp Site of Lord Dunmore (approx. ¼ mile away); Hocking Valley Railway (approx. 0.3 miles away); The Hocking Valley Coal Strike (approx. 0.4 miles away); Daniel Nelson (approx. 0.4 miles away); E. M. Poston (approx. 0.4 miles away); Veterans' Memorial (approx. 0.4 miles away); Fort Street Cemetery (approx. half a mile away). 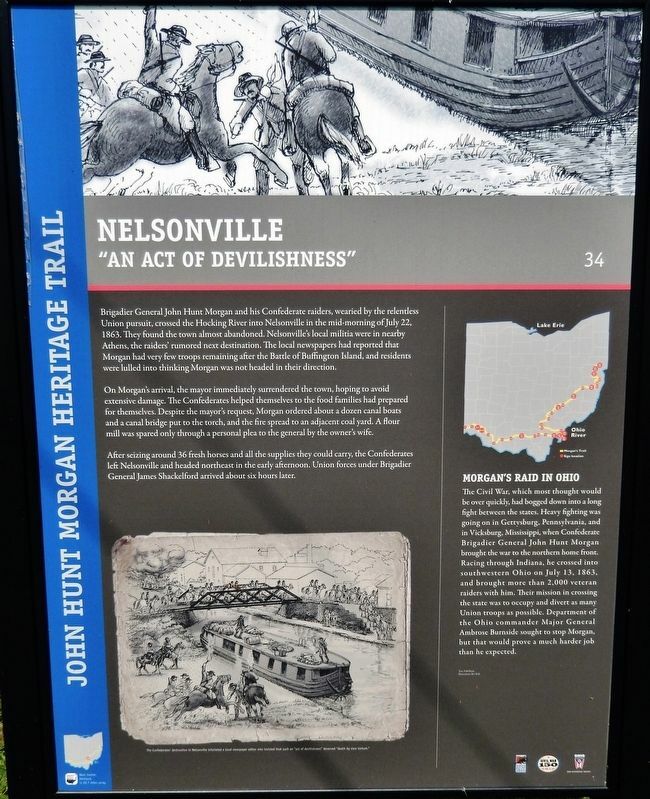 Touch for a list and map of all markers in Nelsonville. More about this marker. Marker is a six-foot tall composite plaque mounted between metal posts. More. Search the internet for Nelsonville. Credits. This page was last revised on February 27, 2019. This page originally submitted on February 26, 2019, by Cosmos Mariner of Cape Canaveral, Florida. This page has been viewed 61 times since then. Photos: 1, 2, 3, 4. submitted on February 26, 2019, by Cosmos Mariner of Cape Canaveral, Florida. • Bernard Fisher was the editor who published this page.